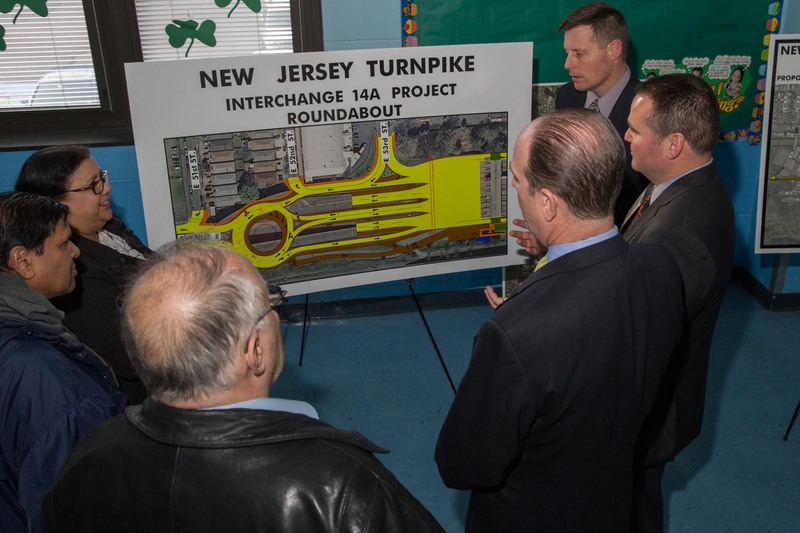 Week of 04/27/15 – From Interchange 14A Toll Plaza to westbound Hudson County Extension, as well as on the ramp from westbound Hudson County Extension to the Toll Plaza, ramp widening work will continue including bridge work, retaining wall construction, and excavation activities. Work will continue on JFK Boulevard, Avenue C, and Garfield Avenue bridges in advance of partial bridge demolition to accommodate the overall Turnpike Ramp improvements. This work will be supported by Bayonne and/or Jersey City Police as necessary. A construction access point is being created this week at the corner of Avenue B and 58th Street for a new sign structure. This construction effort will be supported by the Bayonne Police. Work continues on the east and west sides of the Toll Plaza before and after the toll booth as part of the lane capacity increase. These work zones allow for new toll lane and facility construction. Utility work on Avenue E between E50th Street and E52nd Street will continue, including underground communication, gas main and water main activities. Daily travel lane shifts are expected. Bayonne Police will provide assistance during construction. 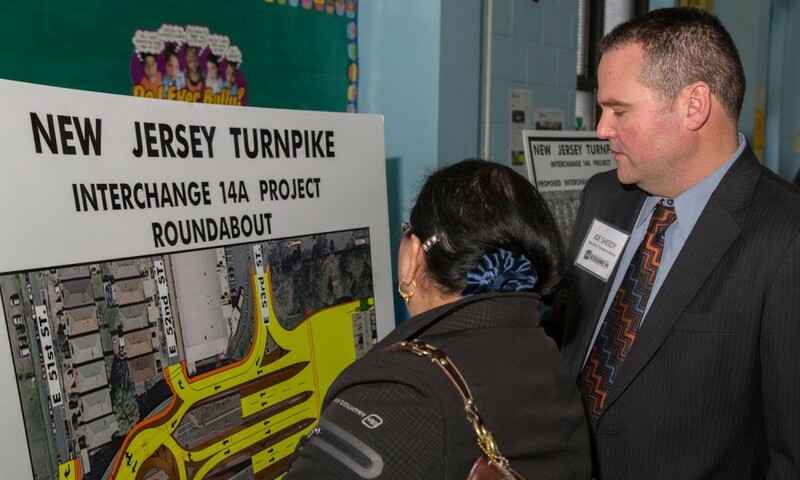 Pipeline relocation work will continue on the west side of Route 440 at the Pulaski Street Jughandle, and will be supported by Bayonne Police. 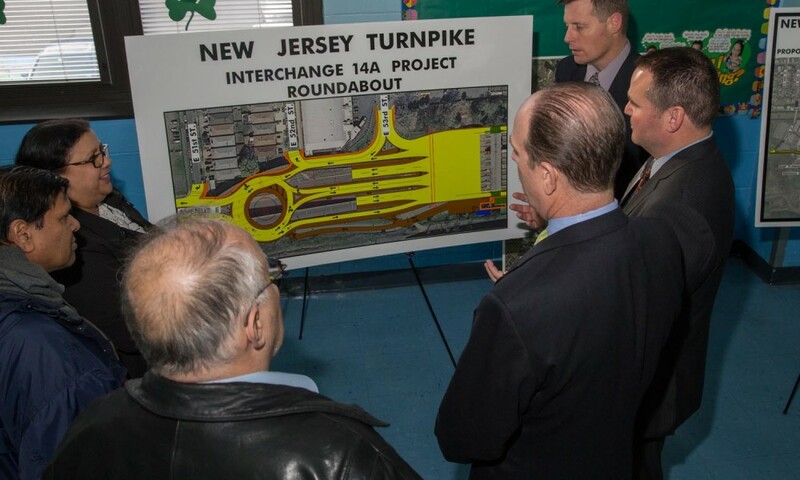 Week of 04/20/15 – From Interchange 14A Toll Plaza to westbound Hudson County Extension, as well as on the ramp from westbound Hudson County Extension to the Toll Plaza, ramp widening work will continue including bridge work, retaining wall construction and excavation activities. Utility work on Avenue E between E50th Street and E52nd Street will continue, including underground communication, gas main and water main activities. Bayonne Police will provide assistance during construction. Week of 04/13/15 – From Interchange 14A Toll Plaza to westbound Hudson County Extension, as well as on the ramp from westbound Hudson County Extension to the Toll Plaza, concrete jersey barriers have been moved from the left side to the right side of the ramp to a long term configuration that will accommodate ramp widening construction. Temporary timber shielding is being installed on JFK Boulevard, Avenue C, and Garfield Avenue bridges in advance of bridge widening to accommodate the overall Turnpike Ramp widening. This is being done to prepare for demolition work, which will be supported by Bayonne and/or Jersey City Police. 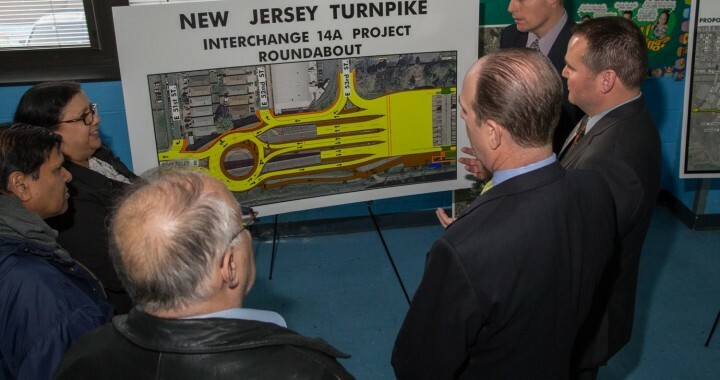 Construction access points are being created at the corner of E58th Street and Avenue B and on Avenue C and the Turnpike overpass to allow for new sign structure construction. On Monday, 04/13/15, new water main installation work will be performed on Avenue E, starting at E50th Street and north. Bayonne Police will provide assistance during construction. We expect this work to continue for the entire week. 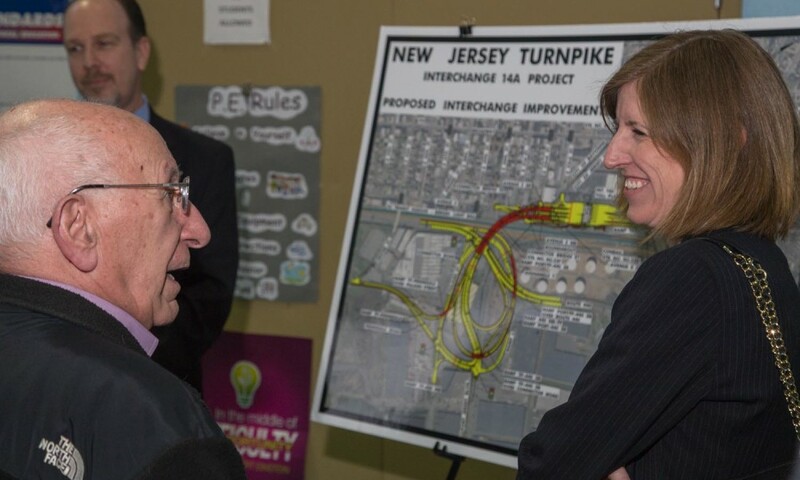 Pipeline relocation work will continue on the west side of Route 440, at the Pulaski Street Jughandle, and will be supported by Bayonne Police. Week of 04/06/15 – From Interchange 14A Toll Plaza to westbound Hudson County Extension, as well as on the ramp from westbound Hudson County Extension to the Toll Plaza, concrete jersey barriers have been moved from the left side to the right side of the ramp to a long term configuration that will accommodate ramp widening construction. On Monday, 04/06/15, new utility installations will begin on E52nd Street and Avenue E. This work will be supported by Bayonne Police, and no disruptions of utility services are expected. E52nd Street will be closed daily at the intersection of Avenue E, from 8:30 a.m. until 3:30 p.m. Two way traffic can access E52nd Street from Broadway during those times. Bayonne Police will provide assistance during construction. We expect this work to continue for four (4) days. If you have any questions, please call the toll-free hotline at 1-800-671-6872, or e-mail info@njta14a.com anytime. Thank you. 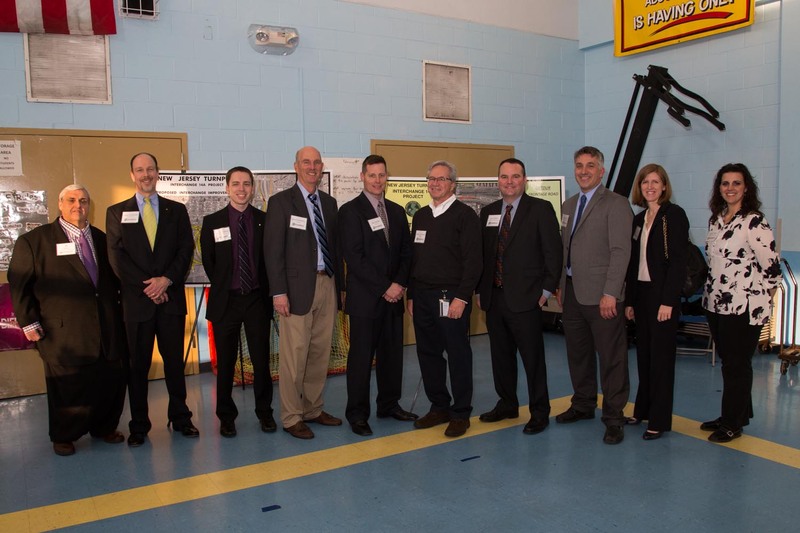 L to R: Shawn Taylor (NJTA), Mike Morgan (GF), Dave Nemeth (GF), Ray O’Donnell (AECOM), Tim Snow (AECOM), Tom O’Connor (AECOM), Joe Sheedy (NJTA), Chris Stokes (SCG), Lisa Navarro (NJTA), & Nicole Pace (SCG). 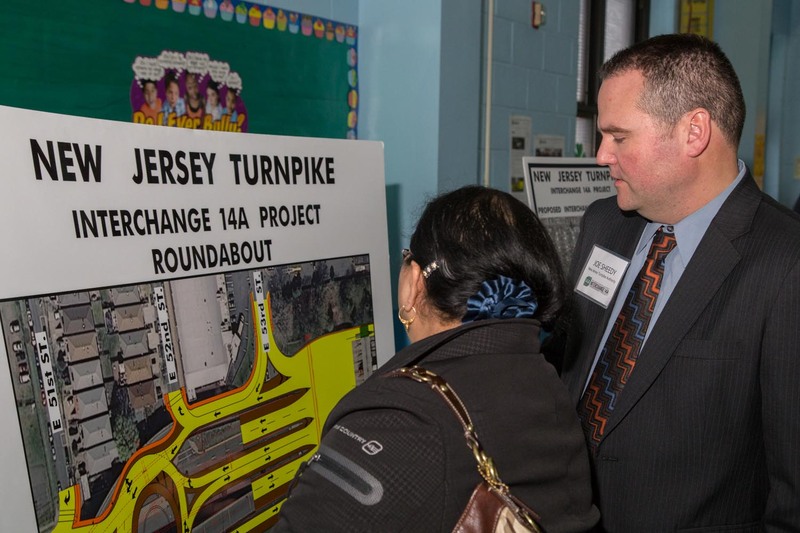 Tim Snow, P.E., explains the project to attendees at the Public Information Center. Local residents have their questions answered by members of the project team. 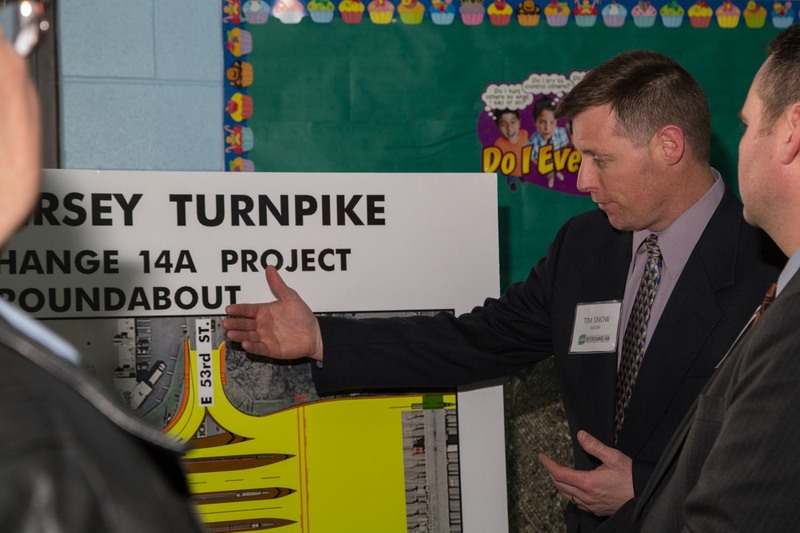 Joe Sheedy from the Turnpike Authority discusses the new toll plaza lanes in detail. Lisa Navarro from the Turnpike Authority is happy to hear one resident’s appreciation for the improvement project. 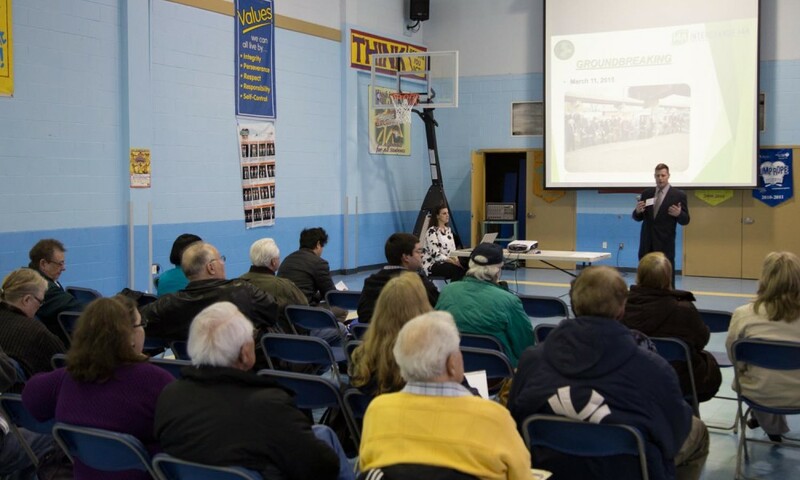 Tim Snow, P.E., speaks to Public Information Center attendees about the groundbreaking ceremony held on March 11, 2015. 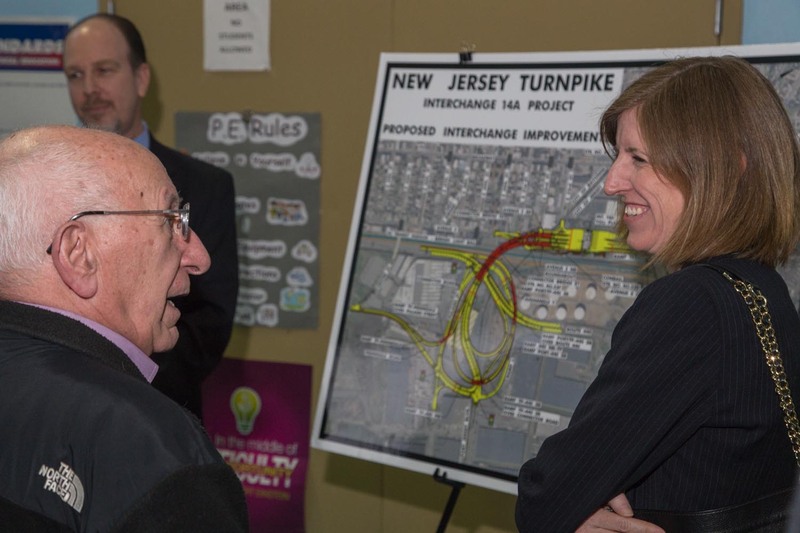 New Jersey Turnpike Authority officials held a public information center to discuss the improvements at Interchange 14A on the Newark Bay-Hudson County Extension of the Turnpike on Thursday, March 26, 2015. 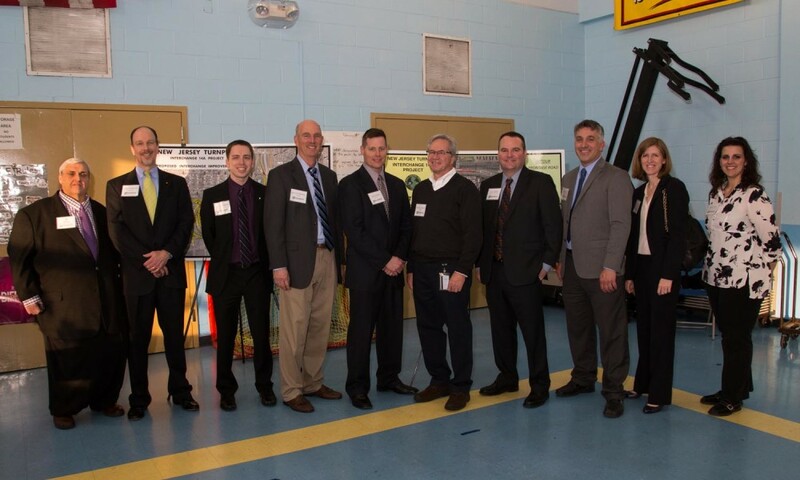 Residents, business leaders, public officials and other stakeholders were in attendance to learn what to expect as construction progresses. 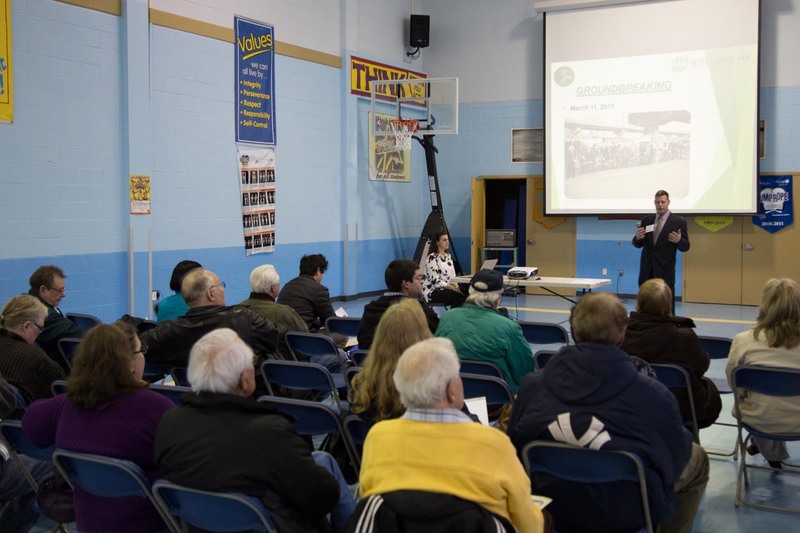 The public information center was held from 5:00 to 8:00 p.m. at the Washington Community School, Multi-Purpose Room, 191 Avenue B, in Bayonne. 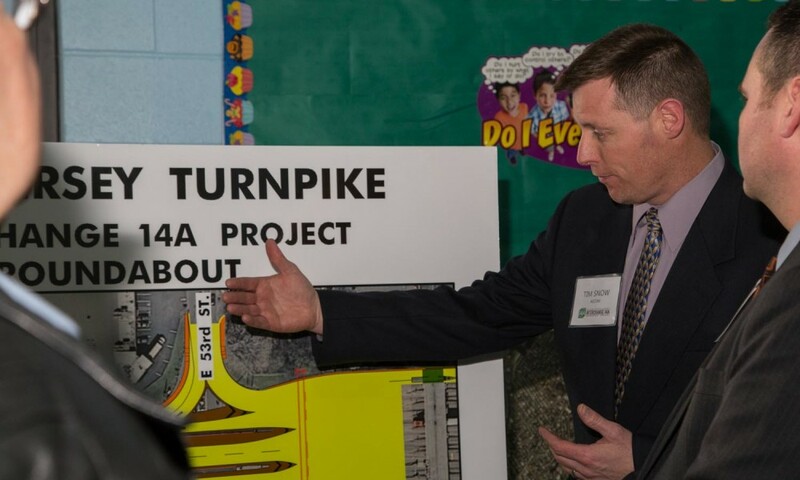 Representatives from the Turnpike Authority and project management team made a brief presentation on the improvements to be made.